"Todo perfecto, como siempre. 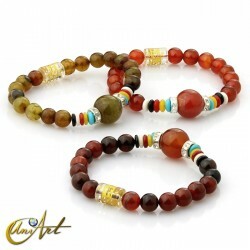 Los productos son tal y como se ven en las..."
Agate round beads bracelets of various colors. 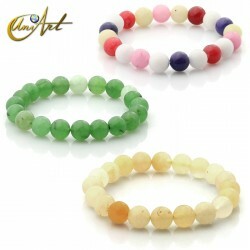 They are nice cheerful and delicate agate bracelets, colorful, elastic and made with round beads of 8 mm in diameter. Available in 8 different colors of agate: Dragon olive green agate, multicolor dragone agate, carnelian agate, multicolor agate, Indian agate, black agate, miracle agate and green agate. Elastic bracelet in 8 mm sandstone round beads. It is a beautiful bracelet made with 8 mm round beads of sandstone, elastic and standard size. The sandstone is known as the stone of the alchemists because of the belief that it has been created by them. It is not a natural mineral, but its high copper content makes it a stone widely used in energy works. 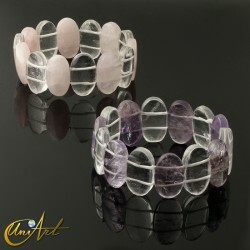 Oval crystal quartz and amethyst or rose quartz bracelet. A beautiful handmade bracelet, elastic, made with oval beads of crystal quartz and rose quartz or crystal quartz and amethyst. Medium size of the ovales: 25 x 15 mm. Medium weight: 62 gr. 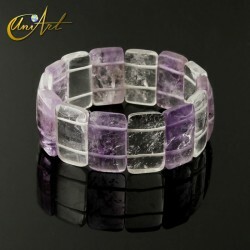 Bracelet model rectangles carved with crystal quartz and Amethyst. With a very sophisticated design this model of bracelet is composed of carved rectangles interspersed of crystal quartz and amethyst. Medium size of the rectangles: 25 x 15 mm. Weight of each bracelet: From 62 gr. until 66 gr. Yellow calcite bracelet in 10 mm round beads. 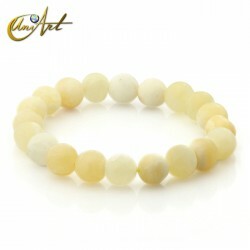 The yellow calcite bracelet is made of 10 mm round beads, has the ideal size to be used by anyone, is elastic and has an internal circumference of about 19 cm. Jade bracelet in 10 mm round beads. Beautiful jade bracelets of different colors, green jade, yellow jade and mixed jades dyed in various colors. 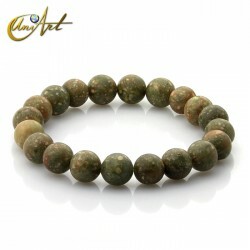 The jade bracelets are made with round beads of 10 mm in diameter and their size is standard, suitable for wrist up to 19 cm in circumference but being elastic they can be used by people of somewhat larger wrist. Find a great variety of bracelets made with the best semi precious stones in a handmade process that makes them very special products. 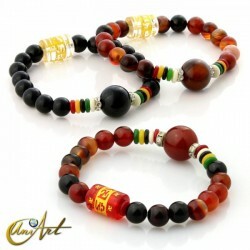 In addition, each bracelet has special characteristics thanks to the power of the crystals in your hands. 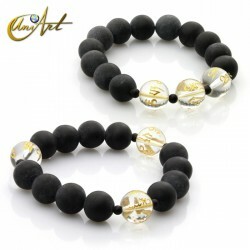 We sell bracelets that are fine bijouterie, ideal as fashion accessories and for specific purposes, because they provide people who carry them the different properties of each stone. Our prices are low and you can get significant discounts due to the promotional packs to buy retail and wholesale. 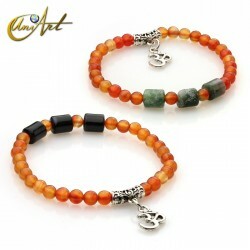 Within this range, we have lucky bracelets, Tibetan bracelets, Buddhist bracelets, mantra bracelets and many more. We invite you to discover them!